If anyone hasn't seen the little blue yet, they probably still have a chance. 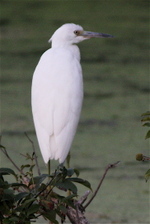 He was near the warden's Watch at dusk on Sunday night, and he was there bright and early Monday (Labor Day) morning. Late summer, and the Celery Farm is a great place to chill -- especially when a pair of greats float by. 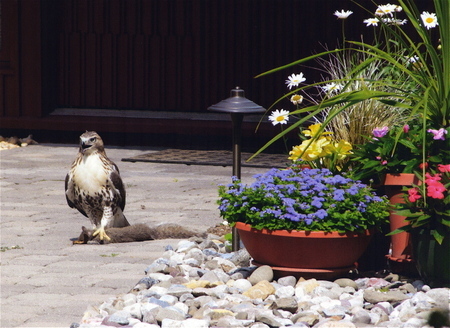 Les Shenkler of Allendale took this shot in his driveway of nature's food chain in action. I'm guessing, but the red-tail is probably the higher link. 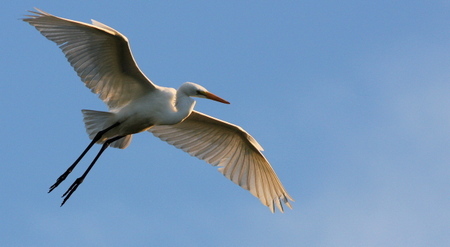 Handsome bird. 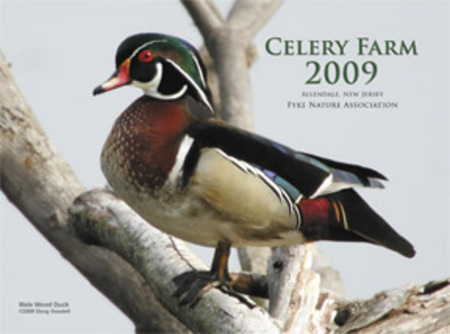 I got my first look at the new 2009 Celery Farm calendars, and all I can say is: Wow! the 2009 calendars are downright unbelievable. The new calendars will be for sale Monday at the Franklin Turnpike parking lot from 10 to noon. They are $15 each, with the proceeds going to the Fyke Nature Association, the non-profit group of dedicated volunteers that maintains the Celery Farm. I suggest that you buy early and often -- they will make great gifts. If they didn't expire at the end of 2009, I would have said they would make timeless gifts. Thanks to Reed Andariese and Kevin Watson for their hard work, and to all the photographers who contributed their work. Great job. Click "Continue reading ..." below for Rob's report.